America has a new top dog! The winner of the highly-anticipated best in show prize at the 2009 Westminster Dog Show was crowned, and as CBS News correspondent Kelly Wallace reports, the champion made history. Seven canines competed for the premier prize at the country's oldest dog show. Final contestants included a Scottish deerhound named Tiger Woods, a Puli known for its dreadlocks and a Scottish terrier who might have been battling a case of the nerves. But there could be only one champion. "I love them all, tonight the Sussex," said best in show judge Sari Tietjen. A 10-year-old Sussex spaniel named Stump, a crowd favorite, won best in show -- the oldest winner in Westminster's 133-year history. Stump only came out of retirement last week and almost died in 2004 from a medical condition. "He hasn't slowed down a bit," handler Scott Sommer said. "I thought it would be fun." "He showed his heart out," Tietjen said. "He was everything you want." The previous oldest winner at Westminster was an 8-year-old Papillon in 1999, and Stump was the first of his breed to capture the silver bowl. Stump now goes on the stump -- taking the place of last year's winner, the beagle named Uno -- as the country's number one dog. One of Stump's first stops was the set of The Early Show, where co-anchors Julie Chen and Harry Smith talked to handler Scott Sommer and David Frei, co-host of the Westminster Dog Show broadcast. Stump's illness in 2004 - "He had a bacterial infection that took them 19 days to figure out. And now he's good," Sommer said. Stump's winning attributes - "He's a great specimen of his breed," Frei noted. "As a Sussex, they should be long, low and level and he's very long -- you can see from pictures. He has this beautiful head piece. A dog of substance. He has to push his way through the underbrush as a flushing spaniel." 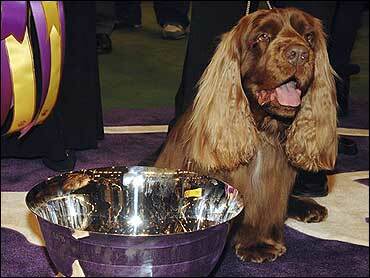 Sussex spaniels - "Somewhat of a rare breed. Been near extinction a couple of times and had to be repopulated in this country. They are from the U.K.," Frei noted. "And it takes dedicated people that understand the breed and the challenges with this breed. They are not for everybody. However this is a friendly, happy dog and probably this morning at the Sussex Club of America, the phone is ringing off the hook."